Island Restoration Specialist Cielo Figuerola shares great news about the Federally Threatened Higo Chumbo Cactus of Desecheo National Wildlife Refuge, Puerto Rico. It’s hot, it’s steep, there are so many spines around us, we are sweating, and we are tired. But suddenly, we see one. And then another! And, yet another one in the distance! It is the threatened Higo Chumbo cactus, (Harrisia portoricensis), coming back to the spotlight after efforts to restore its habitat on Desecheo Island. We are so excited and happy we forget the sweating and the surrounded-by-spines part of the hike and just enjoy the sight of all these Higo Chumbos covering the mountains of Desecheo, a striking view forever to remain in our memories. The Higo Chumbo is a columnar cactus endemic to Puerto Rico with natural populations known only from the offshore islands of Mona, Monito, and Desecheo, west of Puerto Rico. The species has been extirpated from the main island of Puerto Rico, and in 1990 it was listed as Threatened under the U.S. Endangered Species Act, and considered Endangered under the 1997 IUCN Red List of Threatened Plants. Major threats include natural catastrophes like hurricanes, habitat modification, low genetic variation, and herbivory by invasive species on Mona and Desecheo islands. On Desecheo Island, invasive vertebrates were introduced across several undocumented events starting with the arrival of the first Europeans into the region in the 15th century. The new vegetation-chomping invasive species proved to be disastrous for the native cactus. Its numbers plummeted. This is no exaggeration. Reports from botanists Breckon and Kolterman estimated approximately 430 adult and 120 juvenile Higo Chumbos in 1994. Fast-forward to 1999: only five individuals were found on the island. Conservationists sounded the alarm. This cactus was on the verge of disappearing from Desecheo forever. Conservationists sounded the alarm. This cactus was on the verge of disappearing from Desecheo forever. Searching for Higo Chumbos on the island to document its status was no easy task. We visited the island regularly from from 2010-2013 and made meticulous records of the cactus. All accessible areas on the island were searched by a team of two, amounting to approximately 300 hours of searching during the study period! All individuals were marked with a metal tag and GPS coordinates were recorded to keep track of their locations. And it might seem strange, but not unlike the initial procedures at a doctor’s office, we were out there taking measurements of these cacti–height, branches, everything we needed to know to asses their health and the status of the population. Our results, which were published in the Journal Endangered Species Research, were exciting and encouraging! We found and measured a total of 72 Higo Chumbos, with height and number of branches increasing consistently since 2010. We also observed individuals with flowers and huge yellow fruits, a good sign for the overall reproductive status of the population. Thankfully, intensive efforts to remove of invasive vertebrates really have revived hope for the Higo Chumbo cactus. Now that the refuge is free of invasive vertebrates, the Higo Chumbo can stake its spiny, fruity claim in its natural habitat once again. Now that the refuge is free of invasive vertebrates, the Higo Chumbo can stake its spiny, fruity claim in its natural habitat once again. This turnaround is owed to the tireless (and sweaty!) efforts of field teams and the generous donors that supported the project. 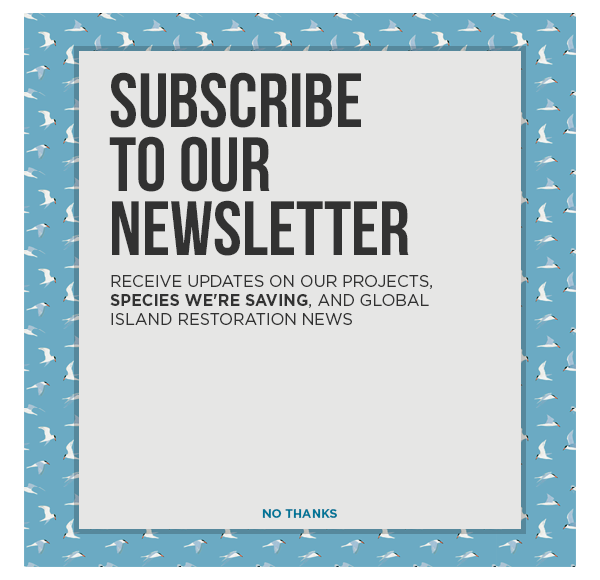 Desecheo National Wildlife Refuge has faced a number of ecological challenges over the past century, but thanks to passionate, hopeful individuals,, it seems that this incredible place is starting to feel like itself again.